Hey, so I’ve not really blogged much on Product Management. However, I went to Product Tank Manchester the other week, and it has inspired me to write a little something. Firstly, for such a young role, I was encouraged by the attendance. There must of been 120 people in the room. I arrived fresh from the plane from Berlin, and had been awake since 5.30am, so was flagging quite a lot. The talks were all of a great quality, and cleverly done, and refilled me with energy. The talks by Randy Silver (ex Sainsbury) and Tom Bradley (Code Code Computer Love), were both very good, and covered various angles of Product Management. I loved how both of them were pretty open, and also made me laugh and we even had some audience interaction over job titles! However, the talk by the Megan Caywood (Revolt) was inspirational, as she showed how she’d applied herself across a number of different roles over the years by just going for it. The banking industry is interesting at the moment, and I couldn’t help but think about my own experiences in Berlin, trying to withdraw cash. It shows that whilst we can create a perfect standalone product, it’s only by making the full experience a good one, can we make that great product – can THE perfect product actually exist in the real, and constantly changing world? I’m unsure. So, when abroad finding traditional mainstream bank cashmachines can be a pain. So you compromise, and select a machine you’re not sure about, and are presented with a screen that is basically designed to mislead you into taking a ‘guaranteed’ rubbish exchange rate, or your own bank’s rate. I’ve been testing out Monzo, and was pretty sure their exchange rate was good. However, with the sun shining onto the screen in Berlin, and wanting to go and eat right then, I selected the wrong button. I’d got my monthly cash withdrawal limit out at a non-competitive exchange rate. Even with the UK’s poorly performing £, this was a frustrating experience. There was no way to reverse this. But I did get to eat. It was a deliberately poor UI and UX. With Monzo’s reputation for great customer service, I wondered if they could somehow work their magic, and reverse this? Into their support chat I went. Simple. Alas, no help! But I did further suggest that they could further warn users of their system what to look for, and was happy to be told that this feature was actually already in the product roadmap!! I was pretty amazed. I’m confident that Revolt and N26 would deliver a similar customer experience. Either making users happy with the actual features, or being able to offer great customer support. So, this feels like were moving in the right direction of being able to offer a great product experience! 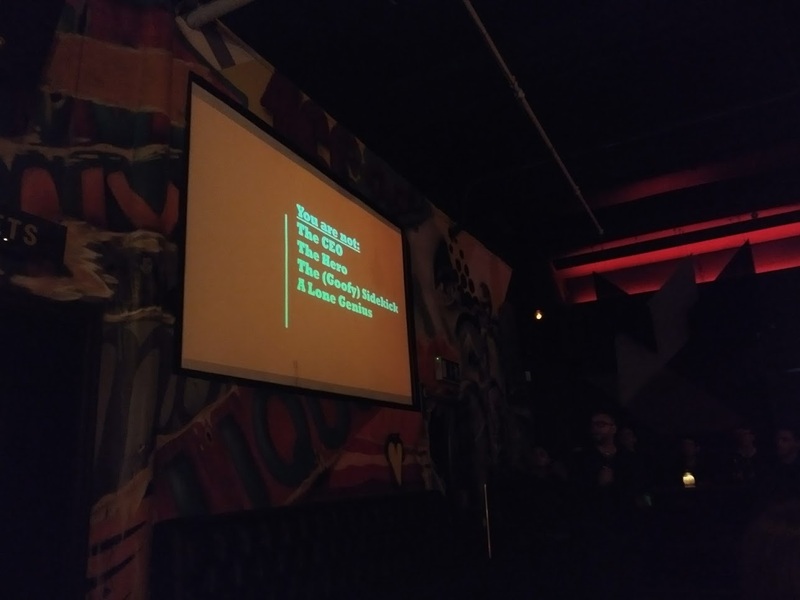 My photos from Product Tank Manchester are pretty dark. For the official, and great ones, head on over to Product Tank Manchester’s on meetup.